Sweet Alyssum is one of the favorite flowering plants among gardeners and landscape designers. This small plant with its tiny flowers is very useful in gardens and landscapes – it is a good filler plant under larger specimen landscape plants, it makes dense and flowery mats in landscapes, it also makes excellent border plants, Sweet Alyssum is an excellent container plant as well. 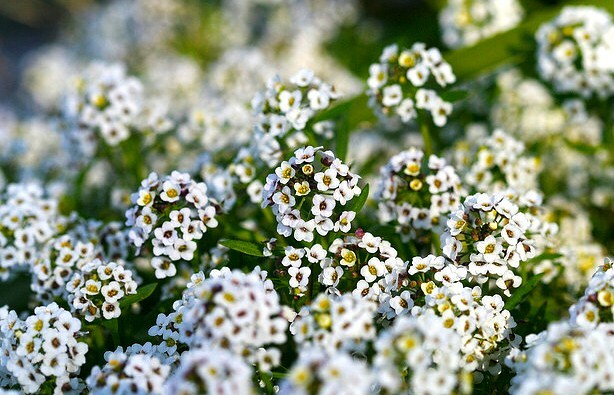 Sweet Alyssum is a remarkable bloomer too; it flowers all through the spring and continues to bloom in summer. Because of its long flowering season and small size, Sweet Alyssum is often grown as a companion plant with other flowering plants. Sweet Alyssum (Lobularia maritima), once classified in the genus of Alyssum, is now placed in the genus of Lobularia but it is still known by its common name ‘Sweet Alyssum’ – ‘sweet’ is because of the sweet fragrance of its white or purple flowers. Sweet Alyssum is quite easy to propagate. It is grown from seeds sown in early spring. The plant requires a loamy and well-drained soil under full to partial sun. With moderate watering and good exposure to sun, Sweet Alyssum grows quickly and starts blooming within a few weeks after germination. In its original Mediterranean climate, the plant grows as perennial, however in colder climates it is grown as an annual bloomer. Besides the common variety, a number of cultivars of Sweet Alyssum are also available for cultivation. These include: ‘Snow Cloth’, ‘Oriental Nights’, ‘Snow Drift’ and the ‘Golf Series’.